For quantitative determination of ethanol and alcohol metabolism. • Sensitive and accurate. Detection range 0.04 - 4% alcohol in 96-well plate assay. • Convenient and high-throughput. The procedure involves adding a single working reagent, incubation for 8 min, adding a Stop Reagent, and reading the optical density. Can be readily automated as a high-throughput 96-well plate assay for thousands of samples per day. • Versatility. Assays can be executed in 96-well plate or cuvet. Alcoholic drinks are among the daily consumed beverages. Studies have shown heavy alcohol consumption may lead to various forms of liver diseases and to increased mortality rates. 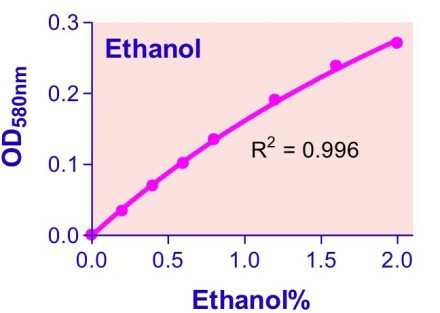 Quantitative determination of alcohol (ethanol, C2H5OH) finds applications in basic research, drug discovery, clinic studies and winery. Simple, direct and automation-ready procedures for measuring ethanol concentration are very desirable. BioAssay Systems’ QuantiChrom™ ethanol assay kit is based on an improved dichromate method, in which dichromate is reduced by ethanol to a bluish chromic (Cr3+) product. The intensity of color, measured at 580 nm, is a direct measure of the alcohol concentration in the sample. The optimized formulation substantially reduces interference by substances in the raw samples and exhibits high sensitivity. 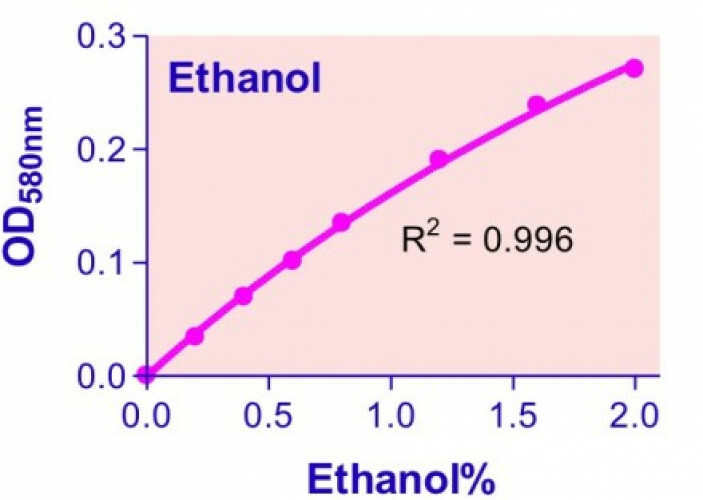 Applications For quantitative determination of ethanol and alcohol metabolism. References Assay: Ethanol in Yeast culture medium (Pubmed). 2. Wang, J et al (2009). Altered pattern of Na,K-ATPase activity and mRNA during chronic alcohol consumption by juvenile and adolescent rats. Cell Mol Neurobiol. 29(1):69-80. Assay: Ethanol in Rat blood (Pubmed). 3. Biggio, F et al (2007). Flumazenil selectively prevents the increase in alpha(4)-subunit gene expression and an associated change in GABA(A) receptor function induced by ethanol withdrawal. J Neurochem. 102(3):657-66. Assay: Ethanol in Rat Primary neuronal cultures, medium (Pubmed). 4. Khanna, D et al (2007). Inducible nitric oxide synthase attenuates adrenergic signaling in alcohol fed rats. J Cardiovasc Pharmacol. 50(6):692-6. Assay: Ethanol in Rat serum (Pubmed). 5. Kim, HR et al (2011). Raw starch fermentation to ethanol by an industrial distiller’s yeast strain of Saccharomyces cerevisiae expressing glucoamylase and ?-amylase genes. Biotechnol Lett. 33(8):1643-8. Assay: Ethanol in Yeast starch (Pubmed). 6. Alam, MZ et al (2009). Production of bioethanol by direct bioconversion of oil-palm industrial effluent in a stirred-tank bioreactor. J Ind Microbiol Biotechnol. 36(6):801-8. Assay: Ethanol in Plant oil-palm (Pubmed). 7. Pisu, MG et al (2011). Effects of voluntary ethanol consumption on emotional state and stress responsiveness in socially isolated rats. Eur Neuropsychopharmacol.21(5):414-25. Assay: Ethanol in Rat plasma (Pubmed). 1. Lin, YY et al (2009). Protein acetylation microarray reveals that NuA4 controls key metabolic target regulating gluconeogenesis. Cell 136(6):1073-84. Assay: Ethanol in Yeast culture medium (Pubmed).